Carbonation of concrete is associated with the corrosion of steel reinforcement and with shrinkage. 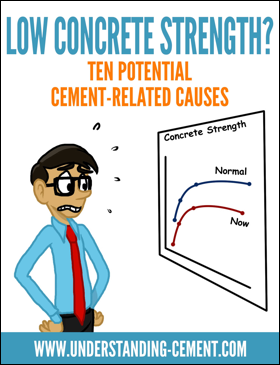 However, it also increases both the compressive and tensile strength of concrete, so not all of its effects on concrete are bad. 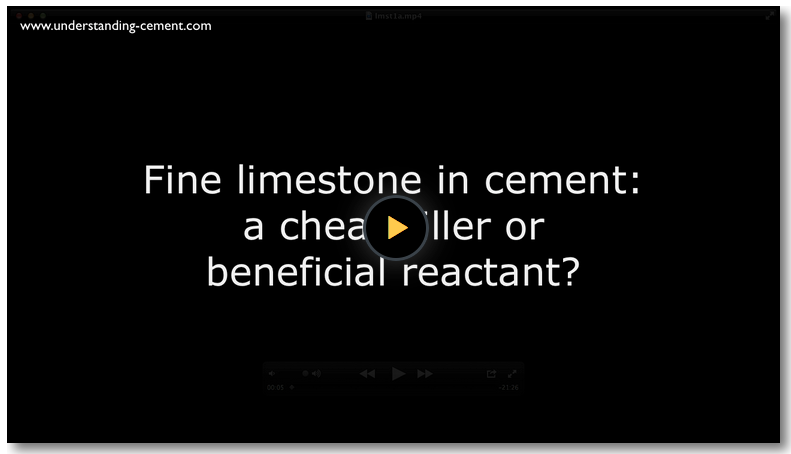 Carbonation is the result of the dissolution of CO2 in the concrete pore fluid and this reacts with calcium from calcium hydroxide and calcium silicate hydrate to form calcite (CaCO3). Aragonite may form in hot conditions. Within a few hours, or a day or two at most, the surface of fresh concrete will have reacted with CO2 from the air. Gradually, the process penetrates deeper into the concrete at a rate proportional to the square root of time. After a year or so it may typically have reached a depth of perhaps 1 mm for dense concrete of low permeability made with a low water/cement ratio, or up to 5 mm or more for more porous and permeable concrete made using a high water/cement ratio. The affected depth from the concrete surface can be readily shown by the use of phenolphthalein indicator solution. This is available from chemical suppliers. Phenolphthalein is a white or pale yellow crystalline material. For use as an indicator it is dissolved in a suitable solvent such as isopropyl alcohol (isopropanol) in a 1% solution. Warning: like all chemicals, phenolphthalein solution should be treated with respect. Both phenolphthalein itself and isopropyl alcohol are harmful and, since it contains alcohol, the indicator solution is flammable. Ingestion, or contact with skin or eyes should be avoided, as should breathing the vapour. Possible effects on the human body include kidney damage and cancer. or do an internet search for something like: phenolphthalein indicator hazard. The phenolphthalein indicator solution is applied to a fresh fracture surface of concrete. If the indicator turns purple, the pH is above 8.6. Where the solution remains colorless, the pH of the concrete is below 8.6, suggesting carbonation. A fully-carbonated paste has a pH of about 8.4. In practice, a pH of 8.6 may only give a faintly discernible slightly pink color. A strong, immediate, color change to purple suggests a pH that is rather higher, perhaps pH 9 or 10. Normal concrete pore solution is saturated with calcium hydroxide and also contains sodium and potassium hydroxide; the pH is typically 13-14. Concrete with a pore solution of pH 10-12 is less alkaline than sound concrete but would still produce a strong color change with phenolphthalein indicator. It therefore follows that the indicator test is likely to underestimate the depth to which carbonation has occurred. 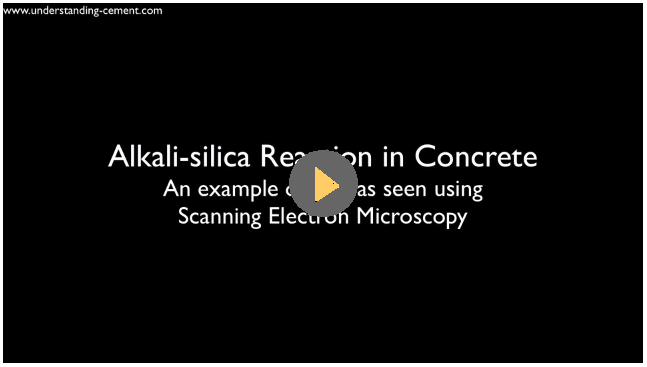 In confirmation of this, microscopy - either optical microscopy using thin-sections, or scanning electron microscopy using polished sections - shows carbonation effects at greater depths than indicated by phenolphthalein indicator. Nevertheless, this test is very useful as a means of making an initial assessment - it is quick, easy and widely used. Phenolphthalein indicator solution applied to a fresh fracture surface through a concrete slab. The indicator has not changed color near the top and bottom surfaces, suggesting that these near-surface regions are carbonated to a depth of at least 4 mm from the top surface and 6 mm from the lower surface. Where the indicator has turned purple - the center of the slab - the pH of the concrete pore fluid remains high (above 8.6, probably nearer 10). 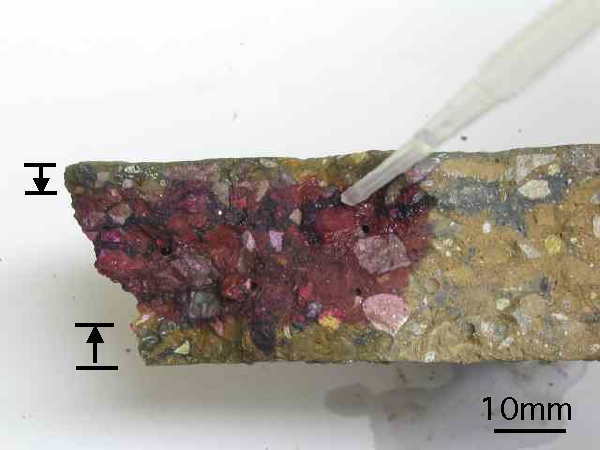 Whether the cement paste here is completely uncarbonated is unclear, despite the strong purple indicator color; a more complete assessment would require microscopic examination. Indicator was not applied to the concrete at the right of this image and so the concrete here retains its original color. The carbonation depth is approximately proportional to the square root of time. For example, if the carbonation depth is 1mm in a one-year-old concrete, it will be about 3mm after 9 years, 5mm after 25 years and 10mm after 100 years. 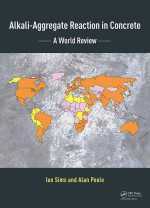 Articles like this one can provide a lot of useful material. 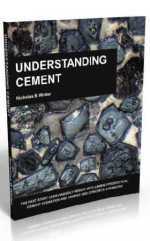 However, reading an article or two is not really the best way to get a clear picture of a complex material like cement. 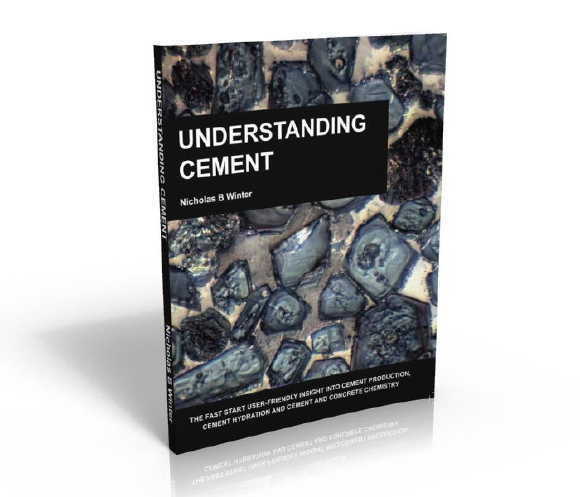 To get a more complete and integrated understanding of cement and concrete, do have a look at the Understanding Cement book or ebook. 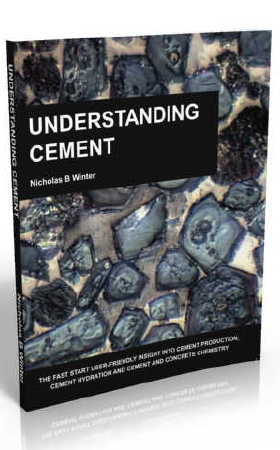 This easy-to-read and concise book contains much more detail on concrete chemistry and deleterious processes in concrete compared with the website. For example, it has about two-and-a-half times as much on ASR, one-and-a-half times as much on sulfate attack and nearly three times as much on carbonation. It has sections on alkali-carbonate reaction, frost (freeze-thaw) damage, steel corrosion, leaching and efflorescence on masonry. It also has about four-and-a-half times as much on cement hydration (comparisons based on word count).